Sterling silver disk, 7/8 inches, hammered, domed and custom hand stamped with names or your favorite phrase. A creamy cultured pearl, or Swarovski crystal, dangles in the center. 2 letter styles available, upper case block, or lower case. 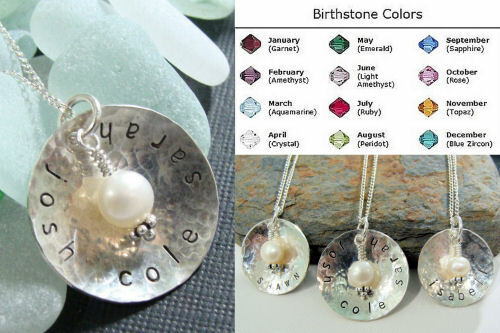 **Swarovski crystal in the color of your choice or cultured pearl is available. Please choose in the drop down menu below. **Chain style may be different, depending on what I have in stock. Please include in the note, if there is a specific chain you want.